Over a year after its original theatrical release date (which was pushed back to March 2013), G.I. 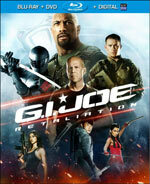 Joe: Retaliation has finally arrived for home entertainment viewing. The movie released to digital retailers about two weeks in advance, but the film is also now available as a single disc DVD; a 3D Blu-Ray combo pack with a 2D Blu-Ray disc, DVD and Digital Copy; and a 2D Blu-Ray combo pack with a DVD and Digital Copy (Supposedly, Best Buy is offering an exclusive extended cut of the film on Blu-Ray as well). This will be a review of the regular 2D Blu-Ray combo pack. I love that Paramount is still offering digital copies in addition to the DVD and Blu-Ray included, and a code inside of the disc case gives you access to downloading a full copy of the movie from iTunes or other outlets (and includes “iTunes Extras” as well). Seeing the film a second time on Blu-Ray just confirmed my feelings that Retaliation is by far a more faithful G.I. Joe story. Many viewers and fans were upset with some characters missing or being killed off in this movie, but, personally, I felt that Rise of Cobra was so far away from what made G.I. Joe “G.I. Joe” that starting over here–even if it meant killing off stars from the first movie–was the way to go. I had no emotional attachment to Tatum’s Duke–he seemed completely different (and lamer) than the leader my generation grew up with in the cartoons–so it seemed like a minor loss to dismiss his character this time around. 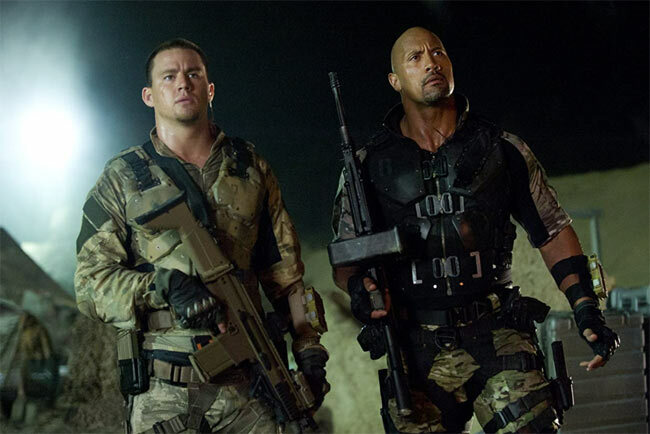 The Rock made a decent Roadblock, although I felt Flint and Lady Jaye could have been much stronger characters (D.J. Cotrona seemed like the weakest possible Flint they could have had. Cotrona had a confused look through most of the film). Still, this felt like the G.I. Joe movie my generation has always been waiting for. Ideally, though, I think the best way to really get the franchise right would be to start over yet again, resurrect characters they’d killed off, and approach it the same way director John M. Chu did. However, that’s highly unlikely to happen. Retaliation just overall feels like a live action cartoon, and because of that it feels much more like “G.I. Joe” to me. Sure, it’s pretty silly and over-the-top, but so was the TV show. Deleted Scenes (3:59) – There are three short deleted scenes that add up to about four minutes. “Pakistani President Assassinated” shows the act of what looks like Snake Eyes killing the Pakistani president, which is something only mentioned in dialog in the final film. “Interns” is a throwaway scene where we see the president (Zartan) walking and talking with staff and being approached by a couple really attractive female interns. It’s kind of dumb and seemed more like it was meant for a Michael Bay film than this one. Finally, “Arlington” shows Block, Flint and Jaye visiting Arlington cemetery where they salute their fallen comrades. Some of the dialog here was reused in another scene in the finished movie. G.I. Joe Declassified (1:12:56) – This is the meat and potatoes of the extras. It’s over an hour of behind-the-scenes material about how they conceived and executed the live action G.I. Joe sequel. It’s split up into several sections with a Play All option. “Mission Briefing” starts out talking about how director John M. Chu was brought on as director and reveals that Chu grew up a fan of the cartoon show and toys in the 80s. He said he went more for realism and keeping true to the essence of G.I. Joe, as opposed to the grander, more sci-fi first outing. They also address the design and look of this film. “Deployment” covers the military training for the cast and how they did some filming on location at NASA. “Two Ninjas” focuses on Snake Eyes and Jinx and shows how they built the dojo set from scratch. Here we hear from Ray Park about training for and playing Snake Eyes. They also talk about redesigning the (stupid) suit for Snake Eyes from the first film to make it look more faithful to the original design (which I felt they accomplished) (there are 2 uses of “bad*ss” here). “The Desert Attack” talks about how they shot the desert scene in Louisiana, and it talks in depth about Duke’s death and how Tatum was on board with the idea. (There’s some bleeped and non-bleeped profanity from Tatum while on the set and it sounded like he used “g*dd*mn” at one point.) “Cobra Strikes” addresses the design of the Cobra prison and how Byung-hun Lee wanted Storm Shadow to show more rage and be to be angrier this time around. We also hear from Ray Stevenson about choosing the character’s accent for Firefly and the new approach to Cobra Commander (to be more faithful to the source material) (there are 3 uses of “bad*ss” here). They also talk more about filming at NASA and Jonathan Pryce playing Zartan as the president. “The Lone Soldiers” is about the trio of Roadblock, Lady Jaye and Flint minus after the loss of the rest of the Joes. It also focuses on Bruce Willis being cast as the original “Joe,” Joe Colton. I was surprised that Bruce actually joined in the documentary to talk about playing Joe. He admitted to being a fan of G.I. Joe and how honored he was to play the part. We also hear a little about the history of Joe Colton the character here as well. 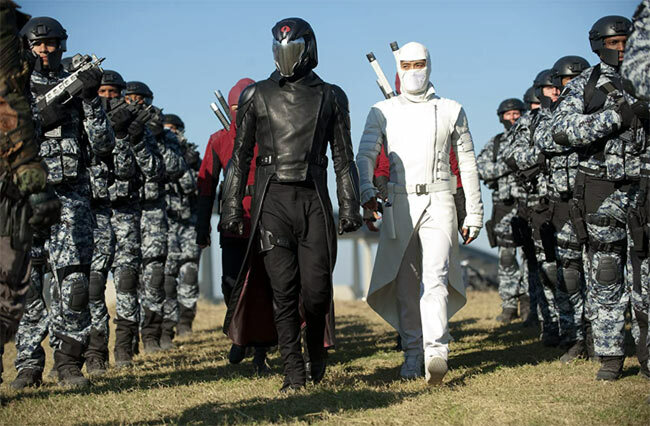 “The Monastery” focuses on the fight between Snake Eyes and Storm Shadow and features Ray and Byung-hun talking about their fight together. They then move to the actual action sequence between Snake Eyes and Jinx and the Red Ninjas as they run across the mountainside, and reveal that the concept for the scene was inspired by issue 60 of the G.I. Joe comic book from years ago. They talk about filming some of the on-location scenery and action in Vancouver, and then show lots of the green screen work used to finish the sequence. Finally, “Fort Sumter” shows the crew shooting at Fort Pike in Louisiana and how they built the war room set from scratch, the vehicles we see (including the classic H.I.S.S. tanks) and the showdown between Roadblock and Firefly (there are 3 uses of “bad*ss” here). Overall, it’s a great set of featurettes.